The results were just okay. The R Square was only 64%, so theoretically 64% of attendance can be explained by looking at the variables I looked at. Is is Expanded’s fault? The P-value for Format was the highest of any variable on this list, which means that it was very bad at predicting attendance. A professional mathematician would conclude that this variable is not a factor and not use it in future analyses. East Coast and Middle America (except Toronto) increase attendance dramatically compared to West Coast tournaments. Toronto is far worse than the West Coast. Furthermore, the East Coast/Middle America flags had the lowest P-value, which means they are highly predictive. There is little “people stop playing” effect that was visible. The P-value indicators were ok, not great, but what they showed was that Jul/Aug/Sep and Jan/Feb/Mar are the best times for tournaments and Oct/Nov/Dec is actually the worst time. Finally, attendance is growing! The P-values were OK, not amazing, but generally attendance has grown year over year. The jump from the year prior to last year was more dramatic than the growth in the last year, but it is still there. Just to amuse the audience, I will say that if you take all of the data at face value, Hartford will have attendance that will be around 750 Masters, whereas Santa Clara will have attendance that will be around 550 Masters. Of course, as I said, our current variables only predict a small percentage of attendance. I have now been one of the amazing commentators for CriticalHit at five tournaments and it has taught me a ton. First, it drives home what an amazing job people like Pooka do providing keen insight. 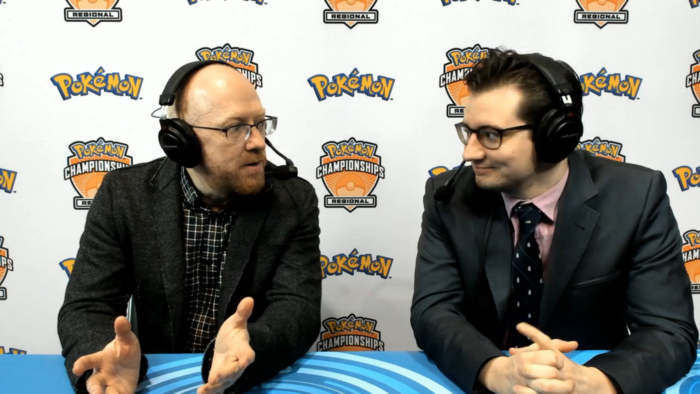 It’s worth keeping in mind that the difference between Pooka and every other commentator you have ever seen is that not only is he a great commentator, he is a better Pokémon player than everyone playing. Do not forget that his last real tournament was Ft. Wayne Regionals 2014, where he went 7-0-2 Day 1 with a totally rogue FairyBox deck. This was during the brief, insane era where you had to completely change decks and formats for Day 2, so he demonstrated a better understanding of deck-building, testing, and the format than anyone else in Pokémon. That’s legit. I am amazed and impressed at how over the last few years groups like CriticalHit have dramatically improved the quality of the rigs, camera, lighting, and streaming experience. 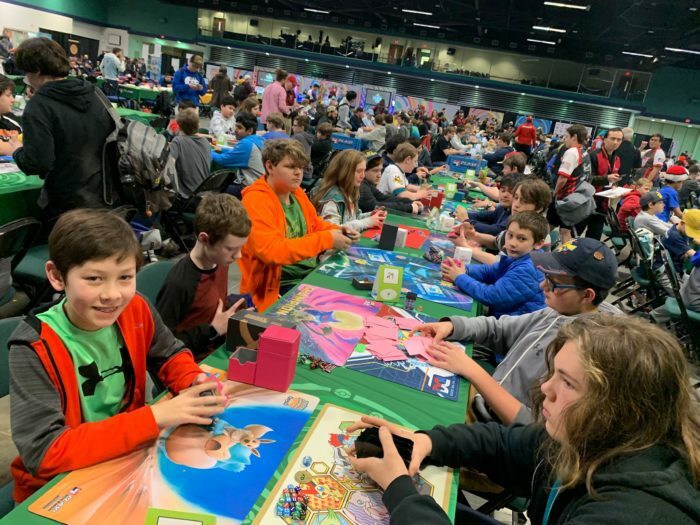 There were more than 1,600 people watching Azul Garcia Griego mount his desperate, one turn from losing, 6 Prizes to 1, comeback on Twitch at Greensboro. Alex Schemanske Guzma’s a Shaymin-EX to take Prizes 4 and 5. Azul has one card in hand—an Archie’s—and he must start his comeback by drawing a card. If it is not burnable, he loses instantly. He draws Battle Compressor and gets to play the Archie’s! He needs Field Blower to use Deluge, he draws cards from the Archie’s and finds an Order Pad! He flips for the Order Pad…HEADS! He gets Field Blower and activates Deluge, but he needs two Superior Energy Retrieval to get the Energy to win and he has none of those, he uses his Shaymin to draw 6 cards and finds a Trainers’ Mail and a Computer Search. Uses the Trainers’ Mail…and finds the Superior Energy Retrieval! Computer Search for the second, and he wins! High RNG yields commentating gold. The chat was appropriately bonkers. 2015 Pokémon World Championships Finals Game 2: Jacob Van Wagner uses Shaymin-EX to draw 3 cards to add to his completely dead hand as he searches desperately for a way to get the exact same Deluge Blastoise onto the field. The first two cards are Computer Search and Ultra Ball, allowing him to instantly load up a monstrous Deluge and become the World Champion moments later. I remember being in the room watching that game and when he drew the Computer Search, the crowd went insane. One thing you could take from these stories is that Blastoise is a super high-roll deck, but the other is that the randomness of outcomes is what creates the drama of Pokémon. The things that are impossible to control are the things that are most exciting about the Pokémon TCG from an outsider perspective. Of course, if you are Mees or Alex, one could not unfairly say they are the things that put you most on tilt. This may be true. 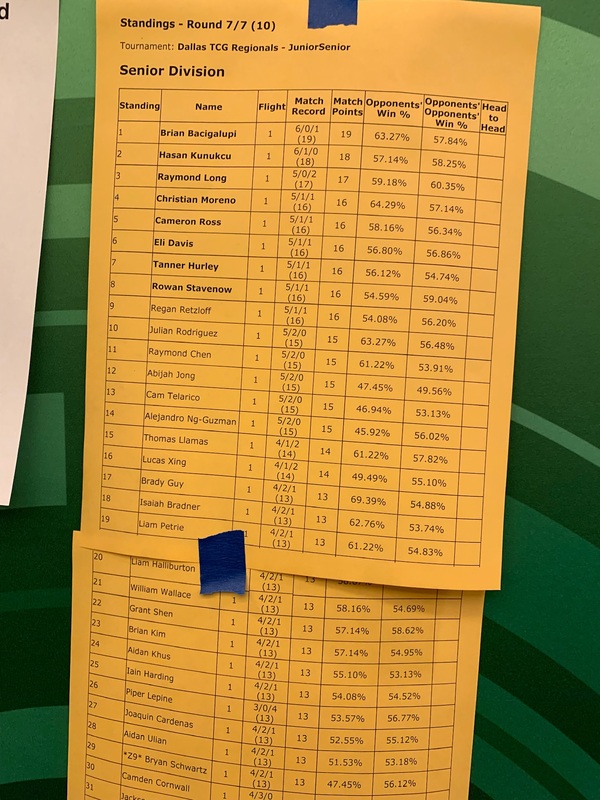 Unfortunately, in Juniors when there are fewer than 48 entries, if there are only points for Top 8, you have to outperform the same guys that make Top 8 in Juniors at a tournament with many more people. The top players are so high travel that they are everywhere. So targeting really big tournaments makes way more sense for Juniors and Seniors than targeting small tournaments. Even really tiny tournaments like Special Events in Mexico and Central America—in Seniors, Tanner H., Regan R., and William W. will show up! So three Top 16 players are suddenly dueling with you to try to get the win. The result is that I frequently feel like I would rather attend a tournament with Top 32 points and 8 rounds of Pokémon than a tournament with Top 16 points and 7 rounds. It feels like that extra round decreases variance and the extra points for Top 32 is meaningful. R1: LWT v ZoroPod — Got double prize loss trading an extra time before he Acerola’d to cost him Game 1. R2: WLT v BuzzWeavBanetteShrine — Milled him out w Oranguru game one but miscalculated damage and benched a wimpod to lose game two allowing Weavile to take a KO. R3: LL v BuzzWeavShrine — Couldn’t find a Supporter T1 either game. R4: WLT v ZoroRoc — Prized 2 Wimpods game 2. R5: WW v BeastBox — Opponent dead draw game 1, game loss game 2 for double Supporter. Final: 87th place @ 1-2-4! Our worst tournament in a long time. 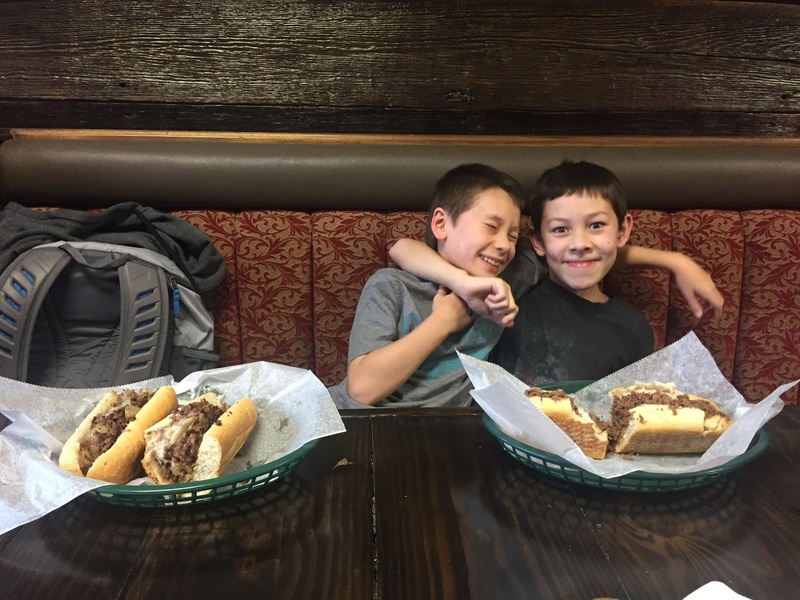 Liam felt like he had played the wrong deck and wanted a chance for revenge so we booked Memphis on a lark to see if we could turn things around a little bit. He actually liked ZoroPod, but felt like he got stalled out too frequently. Without time constraints, he felt like ZoroPod was BDIF, but he just ran out of time to deck people throughout the tournament. Cheesesteaks are the best thing about Philly Regionals. Liam played ZoroRoc. We felt like it was a deck that always won when it went first so then we just had to steal a few games going second and we would have a strong tournament. And lo, we lost only one game going first. R2: WW v Aidan Ulian (BuzzShrine w Counter Energy/Shaymin) — Got good tempo G1 and rolled. Drew fire and killed Diancie T2 in game one. Game 2 he had a sledgehammer and killed a Lele instead of Zoroark and never got another prize. Weakness was good he took 4 Prizes whole game. R4: LL v Regan Retzloff (Ray) — He drew everything turn after turn even as Liam judged him multiple times. R6: LWL v Rowan Stavenow (Zororoc) — Go first. The following day Liam played the League Cup and played a spread deck of his own creation. He got to the finals v Isaiah Bradner and then we had to scoop and dash to the airport. I am fairly confident in retrospect that his spread deck was BDIF. Rather than using Passimian to slow down Zoroark decks, this uses Sudowoodo to keep it from one-hitting Koko or Oranguru and then you can loop Acerola and Hammers until they can no longer attack. This would be much worse now, in a meta filled with PikaRom, Muk, and Lucario. R2: LWT v Isaac Petruski (ZoroDeci) — He bricked Game 1. Was frustrated to lose an autowin. 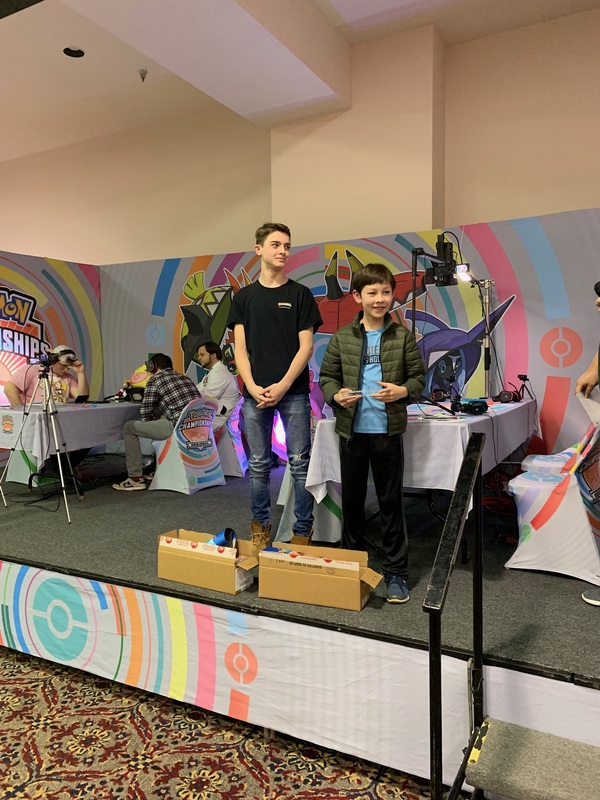 R3: LL v Christian Moreno (Buzz) — Christian played Zygarde-GX, which is an autoloss. R1: WLW v Bodhi Robinson (ZoroGarb) — Bodhi played VS Seeker for Guzma for KO but the Guzma had been Lost Zoned the prior turn, with neither Bodhi nor Liam noticing until a Red Card play a few turns later. So Bodhi gets an unfortunate game loss in a tight game. R2: T v Brian Bacigalupi (ZoroExodia) — They did not finish one game. Liam felt like he was destroying him—he Lost Zoned 14 cards, but he could never get rid of the Oranguru. Brian won every other game in Swiss and did not lose a game until Game 1 of Finals in Sudden Death. We take moral victories, I suppose. R5: WLW v Owen Steuernagel (Blastoise) — He missed Archies T1 after compressing both Blastoise. Liam Get Losts both Blastoise and he scoops. R6: LL v Grant Shen (ZoroControl) — Grant had a teched-out version of the mirror that rolled over Liam. R2: WW v Samuel Garnett (Malamar) — Muk wrecked his Tina and Marshadow plays. R4: WW v Grayson Lang (Zapdos) — Blower really good in Game 2. Muk is good. R5: WW v Jase Warfield (ZoroRoc) — Jase missed Lycanroc for game in game two. R6: LWL v Owen Steuernagel (Blacephelon) — Liam said he got destroyed. T2: WLL v Rowan Stavenow (Zapdos) — I got to stream my son drawing dead for game after game after game. Watching it, you wonder how he won any games drawing like that. Liam added a 2-2 Trev line to Hitmonchan in testing because he wanted more oppressive wall choices. 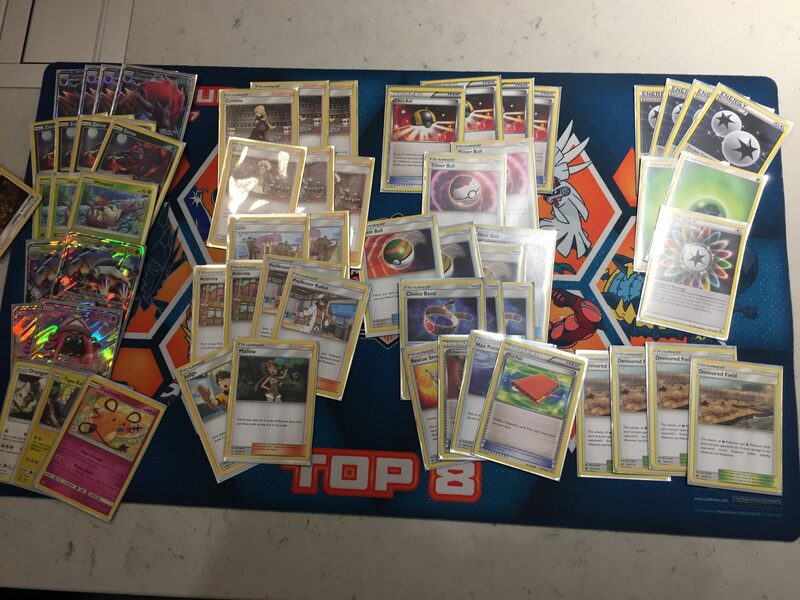 He almost switched to Blastoise at the last minute, but he told me the night before “I might go 2-5, but I just have a vision of myself playing this deck at this tournament!” If you are wondering why decks like Hitmonchan don’t play walls like Hoopa, Liam’s thinking was that it was important to play walls that kept people from doing things. If you didn’t take away options, they would be able to pull off plays. Trev and Wobb take away the ability to do things, so they are inherently better walls than passive walls like Hoopa or a Wailord-GX. I thought that was good insight and was interested to see how Liam did with a deck he created virtually from whole cloth. R4: LWW v Connor Roberts-VanSickle (BuzzRocCario) — Silent Fear! R5: WLW v Isaiah Bradner (Vespiquen) — Trev! R6: WLW v Hunter Smith (PikaRom) — Liam had a crazy T2 in Game 3 where he Enhance Hammers the Flash Energy, plays Strong, Choice, Kukui, Diancie and one hits a PikaRom. Next turn he Guzma–KO’s Tapu Koko ♢ and that is the game. T8: LL v Noa Bell (ZoroToad) — Prize loss for playing Nest Ball w/ a full Bench. I won’t deep dive on lists from past formats as I don’t think it is super helpful, but I think the point one could really take away from this in an interesting way is that you see the same names over and over again. And they see us. It is a small, engaged community of tryhards. There was a big thread on Facebook recently about what has to happen to grow Junior attendance. As someone that has written extensively on the subject, other than rehashing my previous comments I don’t have that much to add. But I wanted to do something here, so I did the same regression above on Junior attendance. The only thing I did was I added Masters’ attendance to see if there was a correlation there. It turns out that Juniors are far less likely to play Expanded than Standard. This was a much bigger deal for Juniors than Masters! AMAZING! Also, Masters attendance is pretty predictive of Junior attendance. Despite that, attendance is shrinking. Each year attendance has gone down. Also, I discovered why I felt like looking at the Northeast was somehow important—my own bias! Northeast was definitely a driver of attendance in Juniors. The only other thing I would add is that I have a funny story from Greensboro. Round 1 was kicking off and I saw a young kid with his mother on their way out of the venue. He was holding a small stack of pretty dog-eared cards and seemed a bit down. I had some crazy feeling about them so I went and introduced myself. 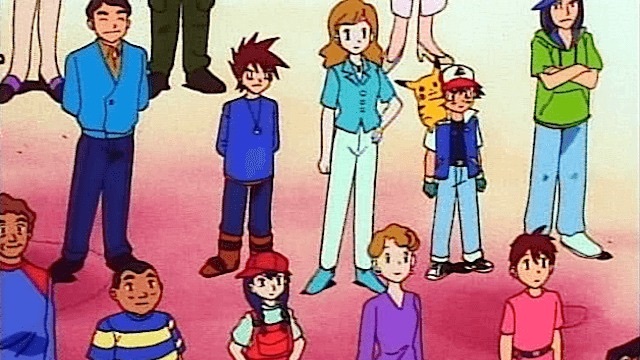 Lo, he was a kid that had collected cards for a year or so, but never attended any Pokémon event previously. Despite the fact that he had never played a single game, he had somehow gotten registered for Juniors and submitted a crazy, crazy decklist (~50 Pokémon, 2 Energy). I sat him and his mom down and spent 2 hours teaching him to play. He and his mom had realized before Round 1 even started that they were totally out of their comfort zone. I hope that spending some time with Leo helped him have a good experience. This begs the question: How did this happen? Is it scalable or replicable? Maybe more importantly, the fact that he found his way here without ever having gone to a local League implies that there are probably opportunities to connect local Leagues to nearby events in a more direct way. It would be great if TPCi could figure this out. We are on the grind a bit more than we have been in the last year and a half. We will be in Denver, Germany, Hartford, and Madison for sure. I have never visited any of those places with the exception of Hartford so this will be a fun few months! As always, come say hi!